Answers to common fall foliage questions. 1. What scenic drives can we take to view the foliage? 2. When do the leaves start changing color? 3. When is the best time to visit for the foliage? 4. Where is the best place to visit to view the foliage? 5. Which area is currently at peak? 6. How long does the foliage season last? 7. Which region of the Pocono Mountains peaks first? 8. What festivals/events are taking place during the fall? 9. Are there any scenic chairlift rides to view the foliage? 10. Where can we go hiking and view the foliage? 11. Where is the best place to take pictures? 12. Which species of trees turn color in the Pocono Mountains? 13. What makes the leaves turn color? 14. Where can I go to see a variety of colors in one location? A: The Pocono Mountains is etched with gently winding, wooded roads perfect for leaf peeping. Some scenic routes have even received national attention for their fall foliage views. In 2013, Travel called Route 507 around Lake Wallenpaupack one of its “Best Fall Foliage Road Trips.” PA Route 6 was ranked among the “Top Scenic Routes in America” by Car and Driver Magazine, and was recognized by the Harley-Davidson Company as “Pennsylvania’s Best Tour Road.” For more information on these and other scenic drives in the Pocono Mountains, look to our list of roads below, and plan your autumn outing today! A: The vast Pocono Mountains region encompasses three distinct fall foliage color zones. Start and peak times vary between the three areas. Depending on conditions, leaves begin to turn in mid-September and reach their peak in early to mid-October. Our weekly Fall Foliage Forecast provides the most accurate information on fall color in the Pocono Mountains. A: Peak times vary between the region&apos;s three color zones. Determine when your destination will be in full color by consulting our weekly Fall Foliage Forecast. A: While tint and timing differ among the region&apos;s three color zones, all areas of the Pocono Mountains will be edged with fall foliage at certain times throughout the season. Select your destination, and then check projected peak time using our Fall Foliage Forecast! A: Updated weekly, our Fall Foliage Forecast notes the percentage of color, percentage of leaves on trees, and projected date of peak for the region&apos;s three distinct color zones. A: Depending on conditions, leaves begin to turn in mid-September and reach their peak in early to mid-October. Lingering leaves and autumn activities can be enjoyed through the end of the October. Look to our list of fall festivals and fall activities for a list of seasonal celebrations, and be sure to consult our Fall Foliage Forecast for autumn updates. A: Projected peak times for the Northern, Central, and Southern regions of the Pocono Mountains can be found in our Fall Foliage Forecast. A: Find the full lineup of autumn events on our fall festivals and fall activities pages! A: See the trees on a scenic chairlift ride at Shawnee Mountain! 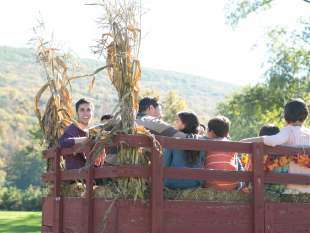 Rides are offered during select fall festivals on the property. A: More than 260 miles of hiking trails wind through the four-county region of the Pocono Mountains. With so many routes to choose from, you&apos;re sure to find the perfect leaf-peeping pathway! Check out our list of hiking trails, or head to one of our National, State and Local Parks. A: Many of the region&apos;s hiking trails and parks feature scenic overlooks and picture-perfect vistas. Find foliage and falling water at sites like Bushkill Falls, or stroll the streets of one of our charming downtowns! All areas of the Pocono Mountains will see autumn color at some time this season. Check our Fall Foliage Forecast for peak dates and information! A: The Pocono Mountains region is home to more than 127 varieties of trees, shrubs and plants. Deciduous trees are those that lose their leaves for part of the year. In the Pocono Mountains, trees including maples, oaks, birches and aspens will add to the autumn colors. A: According to the US Forest Service, three factors influence autumn color: leaf pigments, length of night, and weather. In autumn, the chlorophyll in leaves begins to break down. Green color disappears and yellow to orange colors become visible. Additional chemical changes may occur, leading to the development of certain pigments and red or purplish colors. A: Take a stroll or drive along the scenic Delaware River! CNN has named the Delaware Water Gap one of the best places to view fall foliage. The picturesque Pocono Mountains destination is home to a wide variety of tree species. View our geographic map of the Pocono Mountains to see our three fall foliage color zones and find the route that&apos;s right for you! ROUTE 191 from Bangor to Stroudsburg to Analomink to Paradise Valley to Cresco to Mountainhome to Newfoundland to Hamlin to Honesdale to Rileyville to Lookout.